Michael Palm Toft in action. Panthers owner Ged Rathbone reckons man-of-the-moment Michael Palm Toft could follow in the wheel-tracks of reigning world champion Jason Doyle – by swapping the second tier of British speedway for the sport’s biggest stages. The Danish ace has racked up 44 points in his past three outings for the SGB Championship table-topping city side and also enjoyed a fine run of form for King’s Lynn in the top flight. It’s a fine scoring streak which has served only to increase the high regard in which Palm Toft is held by Rathbone, who made him a full Panthers asset earlier this year. “Jason has proved what is possible when things fall into place for a rider,” said Rathbone. “That has taken him right to the top of the sport and serves as an example of what can be achieved. “If Michael prepares himself and his machinery correctly, and gets a bit of luck on his side, he can go to any level he wants in speedway. “We made him an asset of the club as we genuinely believe he can reach the top. Michael has great natural instincts and can do things on a bike that not many others can. “He is a fast rider, he is an intelligent rider, and he is getting the rewards for putting in hard work and wanting to learn. “He’s been in great form lately, but we’re ensuring he keeps his feet on the ground. The Important thing now is to be consistent and maintain this level of performance. 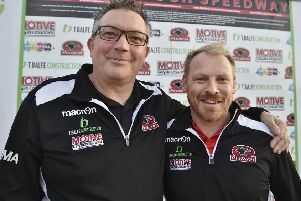 Rathbone believes Panthers have created an atmosphere in which riders can excel. He points to the fine current form of reserve Tom Bacon as another prime example. “Michael is in an environment where he is happy and that is the key to bringing the best out of him,” added Rathbone. “We talk openly and honestly to our riders on a regular basis – whether that is between races or between meetings.